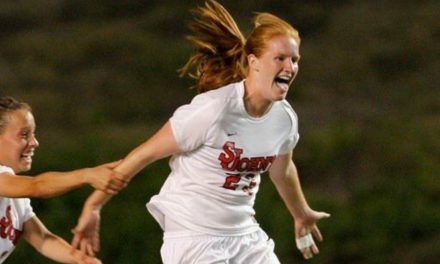 QUEENS, N.Y. – On the heels of a fourth successive double-digit win season, head coach Ian Stone Monday announced the schedule for his 24th campaign at the helm of the St. John’s University women’s soccer program. After two preseason contests, the Red Storm will begin an 18-game regular-season slate that includes five match-ups against teams that earned berths in the 2016 NCAA Division I tournament a year ago. The Red Storm will kick off exhibition action Wednesday, Aug. 9, playing host to Fordham at 5 p.m. at Belson Stadium. Three days later, the Johnnies will conclude preseason play with a 2 p.m. match at Penn State University, which advanced to the second round of last year’s NCAA Tournament. The 2017 season will begin Friday, Aug. 18, when the Johnnies travel to Philadelphia to take on La Salle University. The Explorers return the team’s second-leading scorer, Kristin Haugstad, who scored two goals and six assists. Four days later, the Red Storm welcomes Marist to Belson Stadium at 7:30 p.m. In 2016, the Red Foxes put together a 10-9-1 record, falling to Monmouth in the semifinals of the Metro Atlantic Athletic Conference championship. The Johnnies will head to Connecticut for their next three matches. The Red Storm will visit Fairfield for a 1 p.m. opening kick Sunday, Aug. 27. St. John’s will take part in the Central Connecticut State University Tournament, playing against Connecticut and Harvard on the CCSU campus. UConn took home the American Athletic Conference Championship last season and advanced to the second round of the NCAA Tournament, finishing at 19-3-1. Harvard completed the 2016 campaign with a 10-4-3 mark and captured the Ivy League title to earn a bid the NCAA Tournament. Those matches will kick off at 4:30 p.m. on Friday, Sept. 1 and 3:30 p.m. on Sunday, Sept. 3, respectively. The Red Storm returns home the following weekend to host Loyola Friday, Sept. 8 before welcoming Lehigh two days later. The Greyhounds went 6-6-4 and return the team’s leading scorer from a year ago in Jourdan Ziff. The Mountain Hawks posted an 11-5-2 mark in 2016, earning most of its wins during their non-conference slate. Lehigh will return Sabrina Martz, who was the team’s second-leading scorer with nine points (three goals, three assists) as a sophomore in 2016. St. John’s will play its non-conference road finale the following weekend, traveling to New England to take on Boston College. The Red Storm will kick off against the Eagles on Thursday, Sept. 14, at 7 p.m., taking on a team that finished 11-7-1 last season. Three days later, the Red Storm returns home to close out its non-conference slate Sunday, Sept. 17, playing host to Long Beach State. The 49ers, who went 10-7-4 last season, defeated UC Irvine to claim the Big West Women’s Soccer Championship before falling to Santa Clara in the first round of the NCAA Tournament. The Johnnies will kick off Big East play on Sunday, Sept. 24, traveling to Washington, D.C., to take on Georgetown. The Johnnies and Hoyas will kick off at 1 p.m. on Shaw Field. Last season, the Red Storm played then-No. 6/3 Georgetown to a scoreless draw in double overtime, the best result against a top 10 team in program history. The Hoyas eventually won the 2016 Big East crown and advanced to the semifinals of the College Cup before falling to the eventual national champion Southern California. The following Thursday, the Red Storm will open the home portion of its Big East schedule with a 7 p.m. showdown against Creighton on Sept. 28. In 2016, the Johnnies fell to the Bluejays, 2-0, despite dominating nearly every offensive category throughout the 90-minute contest. Three days later, the Red Storm will host Marquette at Belson Stadium at 1 p.m. The match will be a rematch of last year’s Big East semifinal that saw the Golden Eagles stun the Red Storm, 2-1 in overtime, on a bicycle kick in the 96th minute. The Johnnies then will hit the road for four out of their final six regular-season games. On Thursday, Oct. 5, St. John’s travels to Providence, R.I., to take on the Friars in a 7 p.m. contest at the Ray Treacy Complex. Last season, the Red Storm defeated the Friars twice, 2-1 and 1-0, in a span of four days, first to close out the regular season and then in the first round of the Big East Championship. Three days later, St. John’s heads to Indianapolis, Ind., to take on the Butler Bulldogs for a 1 p.m. kickoff at the Butler Bowl. The Johnnies and Bulldogs played to a scoreless draw in double overtime in their only meeting in 2016. On Saturday, Oct. 14, the Red Storm returns home to play host to Seton Hall at 8 p.m. The Johnnies defeated the Pirates, 1-0, last season to begin Big East play. The following week, St. John’s is back on the road, this time traveling to Villanova, Pa., to take on the Wildcats. Last season, goalkeeper Diana Poulin set the program’s single-season shutout record with her 11th clean sheet of the season in the Red Storm’s 1-0 victory over the Wildcats. The Johnnies return home three days later to host Xavier on Sunday, Oct. 22 at 1 p.m. The Johnnies continued their winning ways against the Musketeers last season with a 3-1 triumph on the road. In four all-time meetings, St. John’s is a perfect 4-0-0 against Xavier. Shea Connors, Samie Scaffidi and Lucy Whipp all scored for the Red Storm in the victory. St. John’s will close out the regular season Thursday, Oct. 26, traveling to Chicago, Ill., to take on DePaul at 3 p.m. A Scaffidi goal in the 70th minute gave the Red Storm a 1-0 victory over the then-Big East leading Blue Demons last season, snapping DePaul’s seven-game win streak at the time. The Big East Championship will be hosted by higher seeds throughout the tournament. In recent years, campus sites hosted the first round match-ups between seeds three through six, while the semifinals and final were played at a predetermined site. This season, the third- and fourth-seeded schools will host the first round on Sunday, Oct. 29, the first- and second-seeded teams will host the semifinals on Thursday, Nov. 2 and the highest remaining seed will host the final on Sunday, Nov. 5. Times for the matches have not been set.